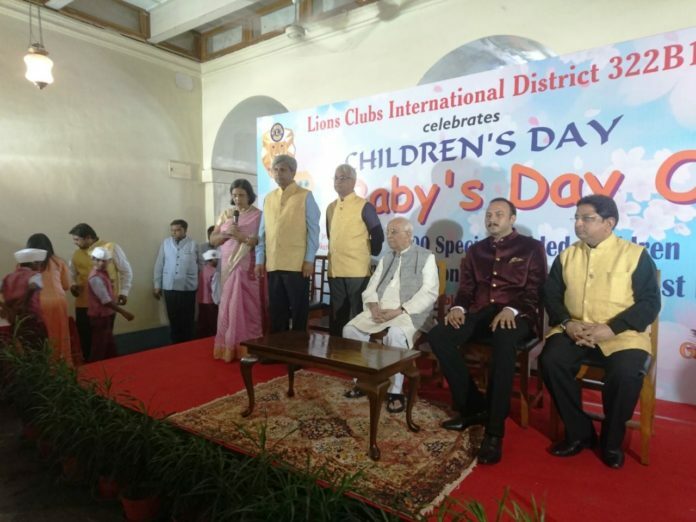 Kolkata: To celebrate the Children’s Day, Lions Club of Kolkata Academia took an initiative to make it memorable and auspicious. Giving the “Children of Lesser Gods” a different experience from the ordinary, they took ninety four differently abled children from 5 schools and ‘New Age Society for All’ to the Governor’s House. They paid a visit and interacted with Shri Kesarinath Tripathi,the Governor of West Bengal. Shri Kesarinath Tripathi addressed to the children & their mentor with a few valuable & inspiring words. Hon’ ble Governor blessed the underprivileged children and encouraged them to lead a normal life. Soon after, the Tricolour balloons were blown up at the lawn. The few, who had the skill to draw, participated in a drawing competition and got gifts from Shri Pramod Chandak, the Lions District Governor. Each of the students was gifted with a gift hamper comprising of a school bag, umbrella, wrist watch, sunglass, tiffin box, water bottle, food packet etc. This initiative is to create an awareness amongst the society for the differently abled children.